Synopsis: Welborn argues that Paul's acceptance of the role of a 'fool', and his evaluation of the message of the cross as 'foolishness', are best understood against the background of the popular theatre and the fool's role in the mime. Welborn's investigation demonstrates that the term 'folly' (moria) was generally understood as a designation of the attitude and behaviour of a particular social type - the lower class buffoon. As a source of amusement, these lower class types were widely represented on the stage in the vulgar and realistic comedy known as the mime. Paul's acceptance of the role of the fool mirrors the strategy of a number of intellectuals in the early Empire who exploited the paradoxical freedom that the role permitted for the utterance of a dangerous truth. 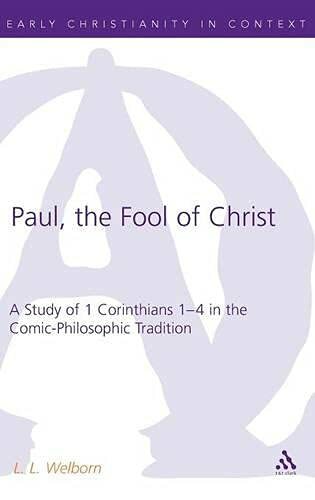 Welborn locates Paul's exposition of the 'folly' of the message about the cross in a submerged intellectual tradition that connects Cynic philosophy, satire, and the mime. In this tradition, the world is viewed from the perspective of the poor, the dishonoured, and the outsiders. The hero of this tradition is the 'wise fool,' who, in grotesque disguise, is allowed to utter critical truths about authority. The book demonstrates that Paul participates fully in this tradition in his discourse about the folly of the word of the cross. The major components of Paul's argument in "1 Corinthians 1-4" find their closest analogies in the tradition that valorizes Socrates, Aesop, and the mimic fool. 'Professor Welborn suggests that Paul's discourse about the "folly" of the "word of the cross" employs the language of jest and mime. Therefore he seeks the meaning of "foolishness" in the Greek world, and consistently applies it to Paul's discourse in 1 Corinthians 1-4. Yet it is noteworthy that not until the Corinthian correspondence were the terms "fool" and "folly" applied by certain members of the Corinthian community (the Apollos party) against Paul to describe their impression of the Apostle and his gospel. Combining a meticulous background study with incisive historical analysis, Professor Welborn sheds light on four crucial chapters of the Pauline literature that illuminate Paul's roots in the Greco-Roman world. This work demonstrates both a general erudition and a grasp of Greco-Roman literature that have become rare among current New Testament scholars. Professor Welborn shows himself master of an incredible number of classical texts and scholarly works while at the same time displaying an intimate knowledge of Paul's theology. He is relentless in the pursuit of Paul's theological agenda and demonstrates that because of a general disinclination to fill the streets with crucified slaves Paul was governed by a social constraint in his discourse about the cross. This book is also fascinating to read. The illustrations of mimic fools included in the texts enhance the reader's understanding almost as much as does the author's impressive ability to reach the reader. I recommend this book with the utmost enthusiasm.' Gerd Lindemann, Professor of New Testament, University of Gottingen, Germany. "Both innovative and controversial. It will be interesting to see if other scholars see the comic tradition as providing an interpretative framework for Paul's rhetorical strategy in the 'fool's speech' of 2 Corinthians 11.1-12.10, and elsewhere in the Corinthian correspondance"
Paul Foster, Expository Times Vol. 118, No. 11. August 2007 --Sanford Lakoff "Expository Times "
4. Paul, the Fool of Christ. A Study of 1 Corinthians 1-4 in the Comic-Philosophie Tradition.